SETTING: The Collaboration for Health Equity through Education and Research (CHEER) was formed in 2003 to examine strategies that would increase the production of health professionals who choose to practise in rural and under-served areas in South Africa. OBJECTIVES: We aimed to identify how each faculty is preparing its students for service in rural or under-served areas. METHODS:Peer reviews were conducted at all nine participating universities. A case study approach was used, with each peer review constituting its own study but following a common protocol and tools. Each research team comprised at least three reviewers from different universities, and each review was conducted over at least 3 days on site. The participating faculties were assessed on 11 themes, including faculty mission statements, resource allocation, student selection, first exposure of students to rural and under-served areas, length of exposure, practical experience, theoretical input, involvement with the community, relationship with the health service, assessment of students and research and programme evaluation. RESULTS: With a few exceptions, most themes were assessed as inadequate or adequate with respect to the preparation of students for practice in rural or under-served areas after qualification, despite implicit intentions to the contrary at certain faculties. CONCLUSIONS: Common challenges, best practices and potential solutions have been identified through this project. Greater priority must be given to supporting rural teaching sites in terms of resources and teaching capacity, in partnership with government agencies. The Collaboration for Health Equity through Education and Research (CHEER) was formed in 2003 to examine strategies that would increase the production of health professional graduates who choose to practise in rural and under-served areas in South Africa. It consists of an academic from each of nine universities in South Africa with a health science faculty, who is involved in community-based education, service-learning or rural health, or similar activities that prepare students for rural and under-served areas. Literature reviews,1,2 a qualitative study3 and a case-control quantitative study4 have been completed, around the same research question. An integral component has been peer reviews at each university in the collaboration, to identify in more detail how each faculty is preparing its students for service in rural or under-served areas. All nine participating institutions have held a review to date, and this article reports on the outcomes. Each university has a different approach and operates in a unique context. The reviews therefore amount to a series of case studies, each complete in itself. We report the insights, learning and recommendations arising from each peer review around common themes and assess these in terms of proposed best practices for South Africa. A case study approach was used, with each peer review constituting a study in its own right. A standard protocol including tools was developed through the first two pilot project reviews. This protocol was drawn up using the literature, principally the 1987 World Health Organization (WHO) Report.5 It was approved by each host university's ethics committee. The sample included all nine participating universities, but the host institution purposively selected the educational programmes to be reviewed according to their own priorities. Within each review, a further level of purposive sampling involved questionnaires and interviews with faculty or school leaders, key informants, relevant faculty staff, and final-year students in each programme who had completed at least one community-based module. Each research team comprised at least three reviewers, each from different universities excluding the university or faculty programme under review. Each review was conducted over at least three days on site. Document reviews, semi-structured interviews, focus group discussions, questionnaires and observations during site visits were used to collect data. A letter detailing the project, a questionnaire and a curriculum framework spreadsheet were sent to the participants before the visit. The questionnaire quantified issues that were subsequently qualified and finalised in the interviews. The sampling process determined the specific questionnaire respondents, drawn from faculty staff who chaired committees such as the faculty curriculum committee and curriculum implementation committee, and who were involved in community-based education and curriculum development or related fields. The interviews aimed to assist the research team in making an informed judgement regarding issues that contribute to prepare students for rural or under-served areas, according to the schedule below. The participating faculties were assessed on 11 themes, including faculty mission statements, resource allocation, student selection, first exposure of students to rural and under-served areas, length of exposure to the rural and under-served areas, practical experience, theoretical input, involvement with the community, relationship with the health service, assessment of students and research and programme evaluation. Each theme was assessed and rated as inadequate, adequate or exemplary (Table I). Draft reports were sent to respondents for feedback, and final reports to local stakeholders at each university. Mission statements were assessed for elements of social accountability generally and those specific to the research question. Only two faculties' statements explicitly mentioned the training of previously disadvantaged students or community-orientated education at all levels of health care, affording them an 'adequate' rating. The others scored inadequate ratings because of no explicit mention of rural areas or under-served communities in their mission statements. Some statements include a primary health care or a community-based approach, but are not explicit about equity. Some mission statements highlight local needs and also emphasise maintaining international standards of 'excellence', without defining what is meant by excellence. Staff composition equity in some mission statements relates to the intention to make the staff more representative of the population. Two faculties, Walter Sisulu University and Limpopo University at Polokwane, are situated in rural areas, which is a statement in itself. The commitment to rural and under-served areas is also evident through the allocation of resources and initiatives such as the creation of research entities focusing on rural or under-served areas and equity. It is only the mission statements of these units or centres that explicitly mention rural and under-served areas. Some faculties have business plans that focus undergraduate training and research towards a community orientation, but not explicitly towards rural and under-served areas. Thus some faculties intend to support work in rural and under-served areas, but not as a faculty-wide movement. While some universities re-allocated resources to primary health care sites, the transformation within health science faculties is progressing slowly, and challenges persist. In many faculties, much teaching has shifted from central hospitals to secondary and district hospitals and community health centres, and rural areas. This has required infrastructure and transport expenditure, and each faculty has developed a different model to address this. For example, one faculty uses the health facilities in a local township for service-learning, and students do not go out into rural areas. Another bought a facility adjacent to an outlying district hospital from a church and developed it into a major student learning centre, with accommodation units, classrooms and a resource centre, but it was found to be too expensive to maintain and was closed. Another faculty developed smaller student accommodation and learning centres at multiple district hospitals simultaneously, each with teaching staff. Challenges faced by health sciences faculties typically pertain to human resources and related issues. Lack of resources has terminated community health blocks which had previously involved students in community-based projects. This burden has sometimes been eased through university and government collaboration, e.g. faculties have successfully managed to negotiate with the provincial government to provide student accommodation while the university carries transport costs to the rural areas. External funders have contributed substantially to the costs of infrastructure in others. Differential selection criteria based on race are the most common feature in South Africa, which theoretically caters for previously disadvantaged students: high school grades for admission to health sciences programmes are significantly lower for blacks and coloureds than for whites. Together with consideration of the applicants' leadership qualities and community involvement, these serve as the minimum criteria for entry into most health sciences faculties. The Health Science Placement Test used by most faculties aims at identifying potential rather than absolute ability, and attempts to support promising applicants with a poor high-school experience. Nevertheless scholars from rural or under-served areas still struggle to satisfy the entry requirements. Some faculties set a recruitment target of a majority of black students per annum, but this has not been met by all that have adopted these criteria. No faculty's selection criteria favour applicants from rural or under-served areas, and only one maintains a proportion of students of rural origin similar to the national population that resides in rural areas.6 Several faculties work with rural recruitment programmes such as the Umthombo Youth and the Wits Initiative for Rural Health Education (WIRHE) scholarships to facilitate entry of such students. Government bursaries with strict beneficiary criteria also facilitate the recruitment of students from rural or disadvantaged areas. Some faculties effectively exclude potential applicants from rural or under-served areas, e.g. testing and interviews only take place in urban centres. In practical terms, the first time students are exposed to rural or under-served areas varies greatly. Medical curricula tend to be theory-and classroom-driven in the first few years and later become more practical and hospital-based. Most of the biopsychosocial teaching in the first few years is theoretical but provides the problem-solving and information-finding skills that students can apply in their clinical years. When it does occur, early exposure to under-served communities usually amounts to brief excursions to peri-urban formal and informal settlements, rather than a deeper involvement. Other opportunities for early exposure are available through extra-curricular experiences such as electives, vacation placements and involvement in student organisations with a community or rural focus, but involve a small proportion of students. Each peer review attempted to quantify the clinical time spent by students in community or rural settings outside the large hospitals. This varies between 3% and 25% of clinical curriculum time in different programmes at different universities, and tends to increase towards the senior years. The maximum length of time of any continuous student placement within a curriculum in a rural area is currently 8 weeks. Non-medical health science students are much more involved in community-based service-learning than medical students. Overall, however, it is questionable whether the extent of their exposure is adequate to prepare most health science students for the realities of the South African rural context and the challenges of geographical distances from specialised health services. Programmes that place students in community or rural sites tend to involve them in hands-on practical experience. Through working in community-based organisations and rural hospitals, students contribute significantly to service delivery, particularly by their final year. In many rural sites where there are few permanent therapists, therapy students provide a service that would otherwise not have existed. These sentiments were not as clearly shared concerning medical students. While students appeared to be well supervised by faculty staff during their community-based learning, student supervision in rural settings was identified as a challenge. In these often more resource-constrained situations, the balance between what students can contribute and the demands they place on the system for support must be carefully managed. The strength of most faculties' curricula is that they largely address the issues of primary health care, human rights, poverty and health, and equity; sessions at some universities explicitly focus on rural health. These were rated as 'exemplary' practices. Early courses such as 'Becoming a health professional' and 'Becoming a doctor' lay the theoretical foundation of a holistic biopsychosocial approach to health and illness. Explicitly linking clinical practice to the broader themes of equity and social justice, however, is poorly presented theoretically. Outside of interactions with patients in health facilities, the only direct community involvement of students is through research or health promotion projects supervised by faculty staff. Site facilitators work with community hosts to orientate students to the community. While these projects involve meaningful activities and significant, well-guided projects with positive results for students and the communities, their limitation is separation from clinical learning. Very few of the projects have been published, which diminishes their value. Apart from the research projects based in community settings, clinical service in later years is almost entirely based in regional and tertiary hospitals with little involvement in the community. One university discontinued home visits to the families of children with chronic illnesses that formed part of the paediatrics block, owing to the pressures of resources and security. When such involvement occurs, it is mostly built into rotations in primary care or district facilities, and not linked to secondary or tertiary hospital care. It therefore appears that the first few years' theoretical input and emphasis on the biopsychosocial approach may be undermined by the traditional biomedical approach and later lack of integration. Again, other health science students have greater community involvement through projects compared with their medical counterparts. Almost all faculties reported that the size, shape and function of the health sciences teaching platform were problematic. Some described difficulty with the budget-driven shift from tertiary to regional and district hospital teaching sites. While non-medical health science students are actively sought to assist in service provision in some facilities, they are generally 'tolerated' but not actively supported by the provincial health services. Despite agreements on paper, partnerships between the faculties and their provincial health departments are not functional, with a few exceptions. Health managers, who are focused on service delivery outputs, are concerned about the impact of time taken by teaching on service delivery. Teaching students takes time away from patient care, prolongs ward rounds, and slows down the queues. On the other hand, students doing clinical clerkships can potentially add to the service as they learn practically. The balance between what students bring to the service against what they take from it is a tension that must be managed across the teaching platform. The aim for this balance is to be positive in favour of the health services, and it must be monitored regularly. Assessment drives students' learning, so including knowledge, skills and attitudes relevant to practising in rural and under-served areas in assessment is significant. No formal assessment is specific to practice in rural or under-served areas, but the integration of knowledge and its application within population health and equity, are important examination criteria. Most faculties include these aspects in some form, but they are not always integrated into clinical assessments. By contrast with clinical competence, which is thoroughly assessed practically, the holistic approach to health care is assessed through the grading of projects and assignments, at a different time and place. For example, language competency is not a criterion for passing final year, despite the centrality of communication in the health sciences, suggesting that some important principles are not carried through to the clinical years. Portfolio examinations of students' experiences are useful to assess whether they have managed to integrate their knowledge. Little systematic programme evaluation was being done apart from scheduled accreditation visits by the HPCSA. Some faculties are developing research proposals that entail programme evaluation. In a few programmes, aside from a course evaluation, no formal exit-level outcome evaluations are conducted. In faculties with well-evaluated programmes, these still fall short in terms of rural or under-served outcome indicators. Some faculties have produced comprehensive assessments, but they have not extended to graduate outcomes. The career choices that health science graduates make and the quality of their practice, has only been systematically addressed by one faculty. Apart from the CHEER projects, there is no research or evaluation on the preparation of students for rural and under-served areas. There is an enormous richness of experience in community-based education in South Africa, using diverse models of education to reach varied outcomes. However, as judged by the 11 criteria developed through this peer review process across nine faculties of health sciences, most fall short with respect to the preparation of students for practice in rural or under-served areas after qualification, despite implicit intentions to the contrary. There is little explicit intention to prioritise rural or under-served areas, and there were consistent gaps between the mission statements and the implementation of educational programmes in all faculties. In respect of community-based education and rural health, some universities are noticeably ahead of others in implementation, and rehabilitation sciences programmes are generally more progressive than medical programmes. All faculties face huge challenges of facilities, logistics, budgets and risk management to get students to rural and community sites for learning, complicated by uneasy relationships with the provincial departments of health that host the students in their facilities. Walter Sisulu University and the University of Limpopo Polokwane campus, based in rural areas, have a distinct advantage in that rural communities are relatively accessible, whereas this is an expensive exercise for metropolitan-based faculties. The capacity to teach and supervise students clinically at many rural sites was limited or dependent on a few individuals. With few exceptions, multidisciplinary and inter-professional learning is not a feature of health sciences education in South African universities. Little objective programme evaluation is being done and there is no evidence regarding the efficacy of educational interventions that would increase the proportion of health science graduates who choose careers in rural or under-served areas. There is little objective evidence to measure the quality of educational programmes in terms of the preparedness of graduates for working in rural and under-served areas.1,11 An important question because of financial constraints is 'How much is enough?'. Student selection and exposure to rural sites during their training makes a difference to eventual career choices,12,13 but the timing of the first exposure to a rural area, the length of time or the quality of the experience that make a difference, have not been quantified. Strategies to increase the number of graduates choosing a career in rural medicine have been suggested.14 But there are no evidence-based 'gold standards' in this field, and the criteria and targets developed in this project appear to be the most relevant factors for educational programmes in terms of the research question. In South Africa, accreditation of medical and health science curricula is undertaken by the relevant professional bodies on behalf of the Department of Education, through an external review process. The criteria and standards developed through this project by peer review could inform aspects of this larger accreditation process, as evidence accumulates regarding community-based education and preparation for rural service. Future research could produce new evidence for the educational evaluation of the social accountability of health science faculties.15 Although producing graduates prepared for and choosing to practice in rural and under-served areas is not the only criterion of social responsiveness of a faculty, it is a significant indicator of the outcome of the broad intentions to promote greater equity in society, as seen in some mission statements. This is particularly important in South Africa, where there is an enormous need to redress past inequities. 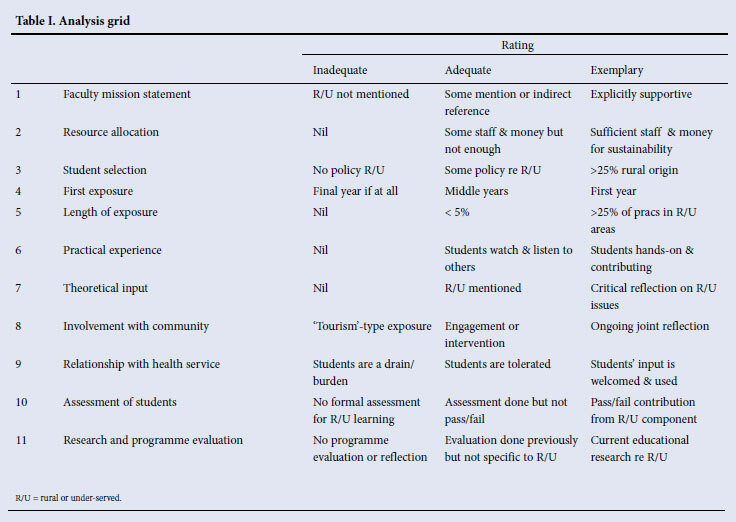 The strategic intentions of the White Papers on the Transformation of the Health System16 and the Transformation of Higher Education17 need to guide programme evaluations. Future research projects could focus on key questions in this regard, e.g. are undergraduate health sciences and medical curricula contributing to the transformation of South African society, or are they essentially 'reproductive'? What are the components of the education of health professionals that must be prioritised to achieve transformation? Are the guidelines and accreditation processes by the professional bodies for health sciences curricula still appropriate to our current and future context? The case study methodology by peer review was useful to understand the operational complexities of translating idealistic intentions into reality in curricula. A review held at Walter Sisulu University resulted in the assessment table, which guided subsequent reviews and ensured that all the important issues were covered systematically. Peers were supportive and understanding of the tasks of programme assessment, knowing that no-one held the answers to the difficult issues facing them all. Further, they knew what to look for, using their own experiences to probe the documents, interviews and presentations. The CHEER team progressively gained confidence in the tools and became clearer about the process and outcomes of the reviews, which is reflected in the quality of the reports that improved over time. The time and resources allocated were sufficient for each team to gain an adequate insight into the strengths and weaknesses of each programme, and the reports reflect this. However, time did not generally allow visits to rural and community sites, so the teams relied on their informants to relate their experiences and perspectives rather than gaining first-hand information. Since much of the information gathered was qualitative, and judgements were required by the protocol, a team approach was crucial to minimise subjectivity. The peer review project has established a framework and a baseline of practices and models in community-based education and rural health that have been documented and shared. The process has built up a community of practice and best practices, and potential solutions have been identified among those facing similar challenges.18 Rural teaching sites are being developed that must be given greater priority in terms of resources and teaching capacity, in partnership with provincial and local government. Schools in rural areas appear to provide some solutions.19 The task is now to build local evidence in the field that will strengthen efforts to prepare graduates better for service in rural and under-served areas,20 and reduce the gap between lofty mission statements and practical realities. Sound research, including longitudinal cohort studies, is needed to establish the most effective educational strategies to achieve appropriate outcomes in terms of graduates' career choices and quality of practice.